President Barack Obama, as every President of the United States has done each year since 1946, proclaimed October 24, 2013 as United Nations Day to commemorate the 68th anniversary of the 1945 Charter of the United Nations. 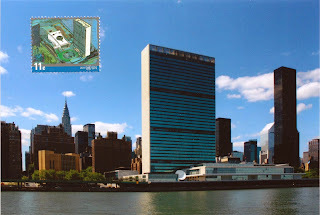 Postcard US-2373503 to Russia, shows the United Nations Headquarters in New York City, arrived in 62 days. It was sent to the United Nations Postal Administration (UNPA) in New York City for mailing with the United Nations stamps on August 20, 2013. For procedures on how to send mails through UNPA, see my previous blog. Some other postcards sent under a separated envelop on the same day, survived a mail catastrophe and arrived their destinations without any postmarks.